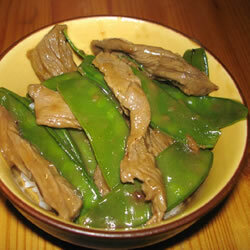 In a small bowl, combine the soy sauce and brown sugar. Then mix in the corn startch. Set it aside. Heat oil in a wok or skillet on medium high heat. Fry the ginger and garlic for about 30 seconds. If you are using powders, wait to add them until you add your sauce. Add the steak and fry for 2-3 minutes, or until evenly browned. Add the peas and cook an additional 3 minutes. Add the sauce mixture (and your powders, if applicable), bring to a boil and stir constantly. Turn heat to low and simmer until the sauce is thick and smooth. Serve. Enjoy! Caution: It WILL be hot… but oh, so yummy! Use any meat you’d like and you can also add any veggies you would like: mushrooms, carrots, peppers, zucchini, water chestnuts. Sometimes we cheat and buy the frozen bags at the store… It turns this quick meal into a SUPER quick meal. Mmmmm. My fave: quick and easy! Looks good! Thanks for sharing your great stir fry recipe with us at Anything Related!